180 Muscle Mix - Great tasting protein shake designed with a special blend of ingredients to help you lose weight, build muscle, and feel satisfied. Your 180 Muscle Mix comes in a 1.5 lb. bag holding 31 servings. Suggested use: Drink one to two Muscle Mix shakes per day for best results. These can be great pre- or post-workout, for breakfast, or for a snack. 60 capsules per bottle - Suggested use: Take two capsules daily with at least 12 oz. of water before breakfast. 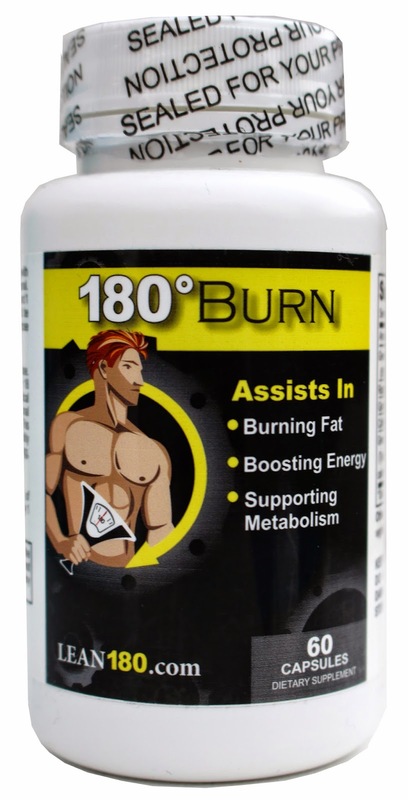 180 Burn is a very safe and effective weight loss and nutritional supplement. You will have more energy, you won't crave carbs, and your body will start burning fat while preserving muscle mass. 30 capsules per bottle - Suggested use: Two capsules daily. Take one capsule before breakfast with 8-12 oz. of water (take with 2 180 Burn Capsules). Take another capsule before dinner with at least 12 ounces of water. This cleanse typically does not cause any stomach discomfort or bowel issues as some cleanses do; however, if it does, take just the capsule in the morning and stop taking the second capsule before dinner. For best results, drink at least 64 ounces of water each day while taking 180 Cleanse and 180 Burn. Safe and Effective Weight Loss Plan that Works Great, Guaranteed! Before starting any weight loss kit, one should always consult with his doctor. Please see pictures for ingredient list. 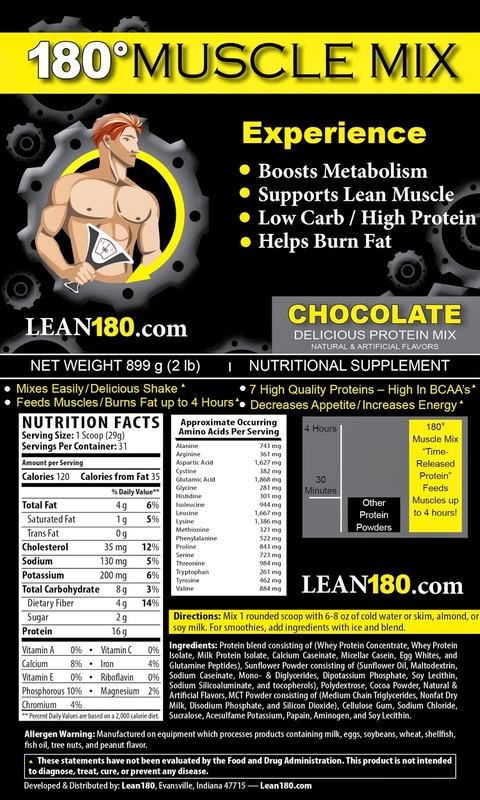 180 Muscle Mix - Drink 1 to 2 shakes a day for best results. 180 Burn - Take two capsules daily with 8-12 oz. of water in the middle of the afternoon. 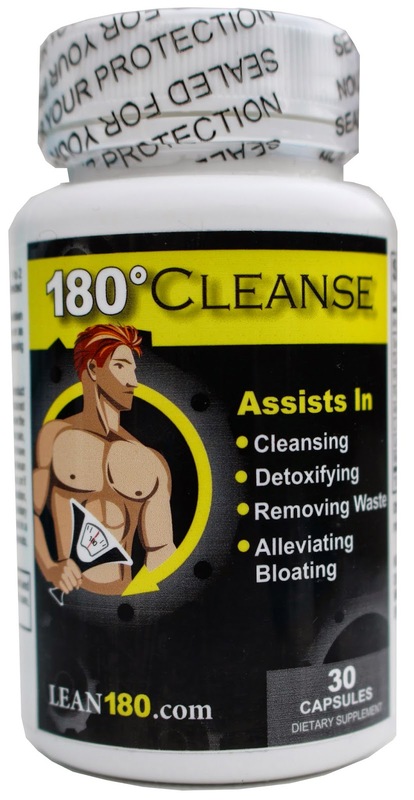 180 Cleanse - Take 1 capsule with 8 oz. of water 15-30 minutes before bed. If 1 capsule is tolerated well, you may take 2 for a stronger cleanse. This is a very effective cleanse, so always start with 1 capsule to see how it affects you. I was excited to try this Get Lean Kit by Lean180.com. I was sent a 7 day supply of each step of the Get Lean Kit. I wanted to make the most of this 1 week trial so I psyched myself to stick to this strictly for the full week. I read the directions, went and bought the necessary food items for the week and then got started on my Get Lean 7 Day Challenge. The first morning when I woke up I had 2 Lean 180 Burn Capsules with 1 cup of plain hot tea. I was ready to give this 7 day challenge a try! Then for breakfast I had 180 Muscle Mix Shake which was 3 T of 180 Muscle Mix and 8 oz of skim milk. It tasted pretty good and I was getting excited for this challenge! At 10am I had 1 cup of Kashi GO Lean Dry Cereal, 3 stalks of celery and 2 cups of iced water. I love Kashi cereal and was thinking cereal and celery? This is a first! For lunch I made a Green Salad with unlimited Non Starch Vegetables, I chose romain, spinach, cucumber and tomatoes with 6 oz of lean turkey and 2 T light balsamic vinegar dressing. I washed it all down with 1 C of caffeine free iced green tea with a packet of splenda sweetener. I enjoy salads so this was a nice lunch and I was feeling great! At 2:30 I took 1 Lean 180 Burn Capsule with 16 oz of Iced Water for a nice mid day boost. At 3pm I ate a cup of mixed berries with t T of light cool whip and 1 cup of ice water. Mmmmmm this was a nice sweet treat. At about 6:30pm I had 6 oz grilled chicken breast seasoned with Mrs Dash and 2 cups of steamed mixed vegetables and 1 C of decaf Green Tea and was feeling pretty proud of myself! About 15 minutes before bedtime I took 1 Lean 180 Cleanse Capsule with 1 C of water. Whew! I made it through day 1 and it was not bad at all. I thought, "I can do this!" and I did for another 6 days and lost 8 lbs by the end of the weeks challenge. 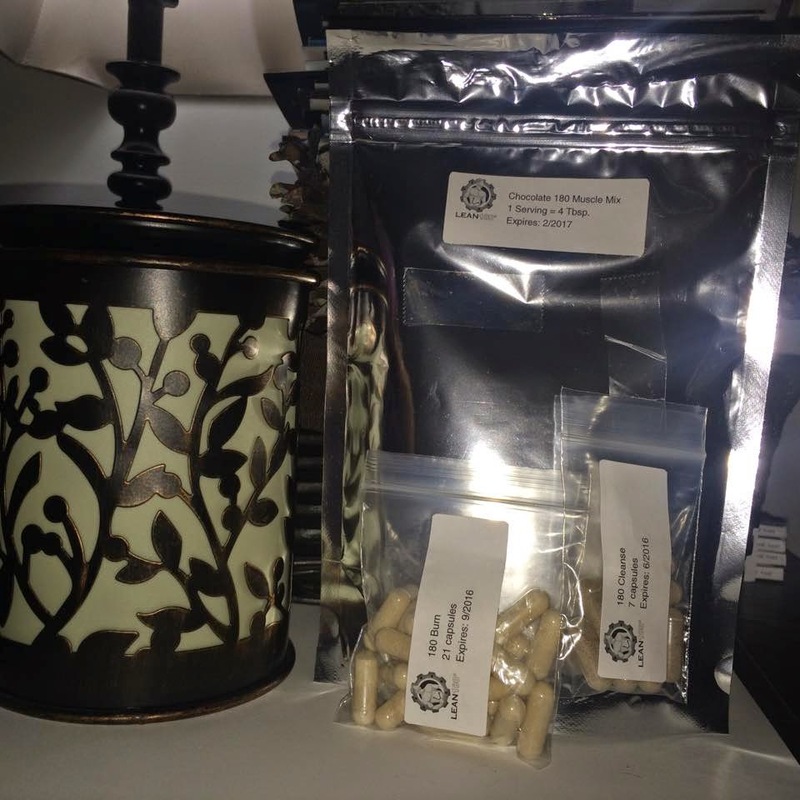 This was a great kick start to quickly see some results to keep me motivated and get my body use to eating small healthy portions throughout the day and incorporate the supplements to help with the weight lost and cravings.